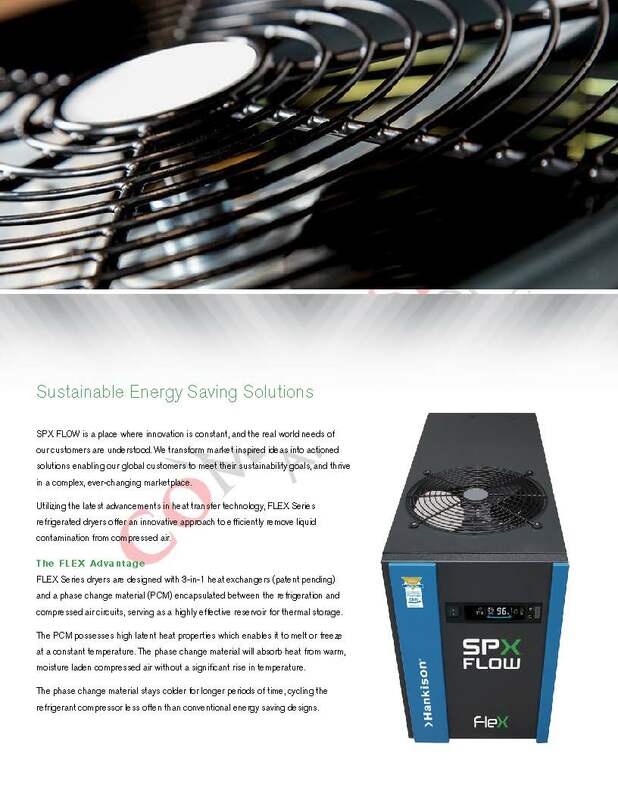 Designed for use where the air demand fluctuates, and full capacity is not always needed, thus saving energy. Generally, eligible for utility rebates. SPX FLOW is a place where innovation is constant, and the real world needs of our customers are understood. SPX Hankison transform market inspired ideas into actioned solutions enabling our global customers to meet their sustainability goals, and thrive in a complex, ever-changing marketplace. 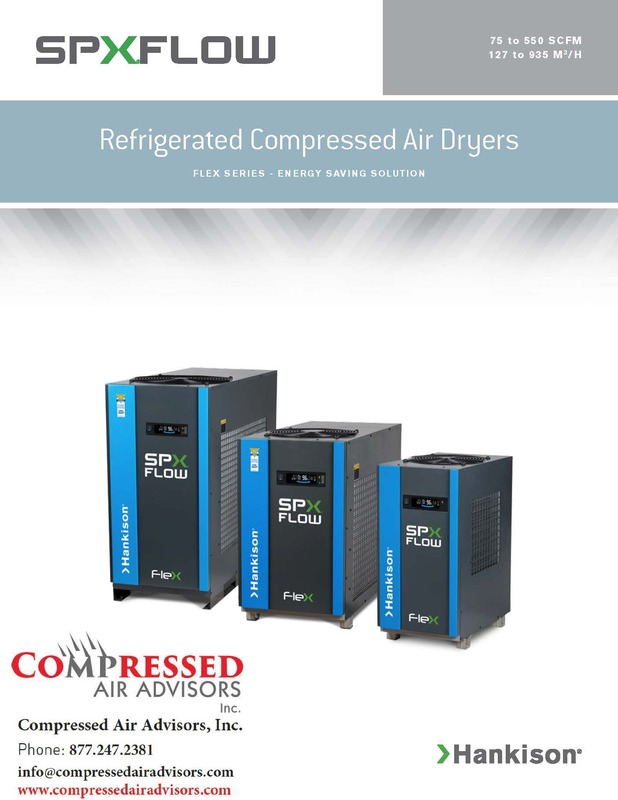 Utilizing the latest advancements in heat transfer technology, FLEX Series refrigerated dryers offer an innovative approach to efficiently remove liquid contamination from compressed air. 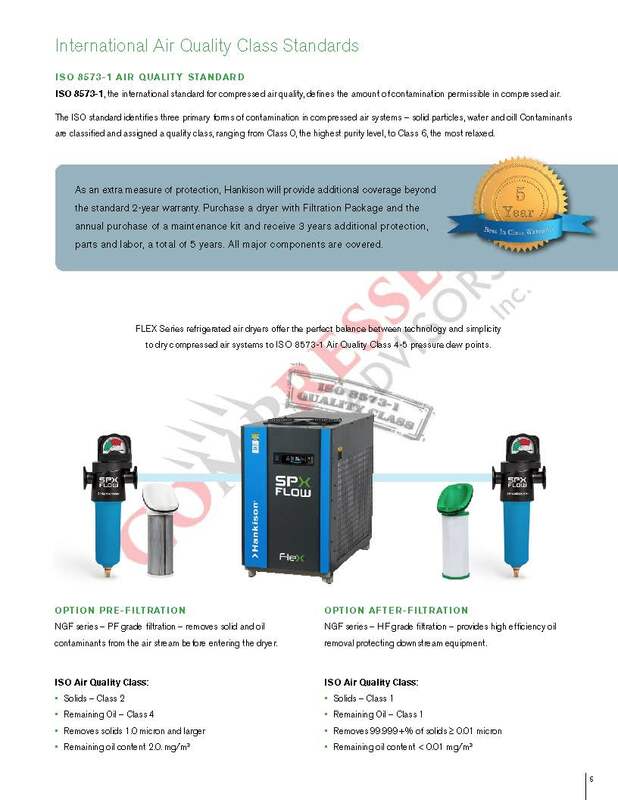 FLEX Series dryers are designed with 3-in-1 heat exchangers (patent pending) and a phase change material (PCM) encapsulated between the refrigeration and compressed air circuits, serving as a highly effective reservoir for thermal storage. The PCM possesses high latent heat properties which enables it to melt or freeze at a constant temperature. The phase change material will absorb heat from warm, moisture laden compressed air without a significant rise in temperature. The phase change material stays colder for longer periods of time, cycling the refrigerant compressor less often than conventional energy saving designs. The FLEX Series lowers air system power costs and improves productivity by matching power consumption to compressed air demand. In a typical manufacturing facility, up to 30% of electricity consumed is for generating and treating compressed air. 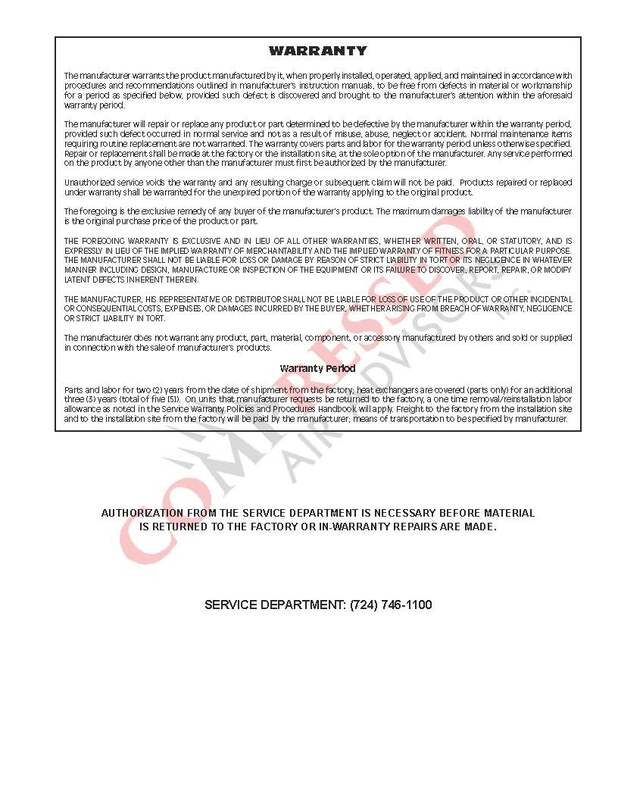 To reduce total cost of operation and qualify for utility company incentive programs, proper air treatment equipment selection and application is required. Compressed air load profiles in most manufacturing facilities fluctuate. The FLEX Series provides cost-effective energy savings by matching electrical power consumed in direct proportion to air demand. Linear load matching is achieved from 0% up to 100% demand. Non-cycling dryers operate with the refrigeration compressor running continuously, regardless of inlet load conditions. 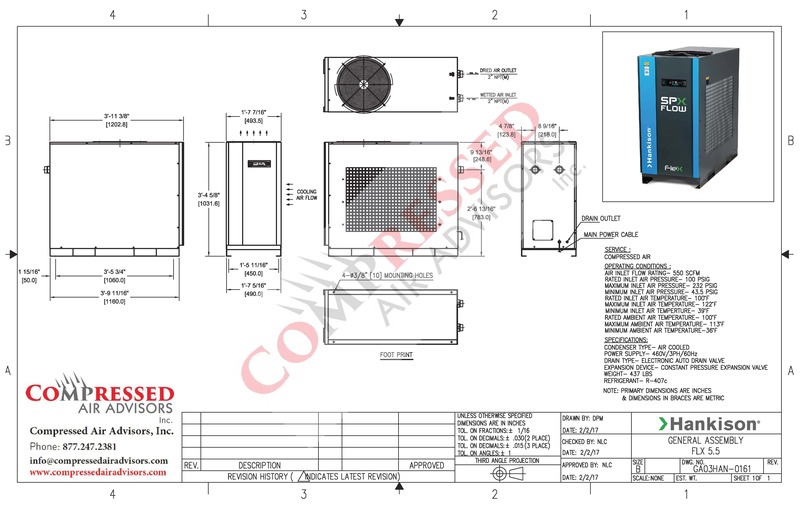 Minimal energy savings are realized from 100% down to 0% inlet air load. 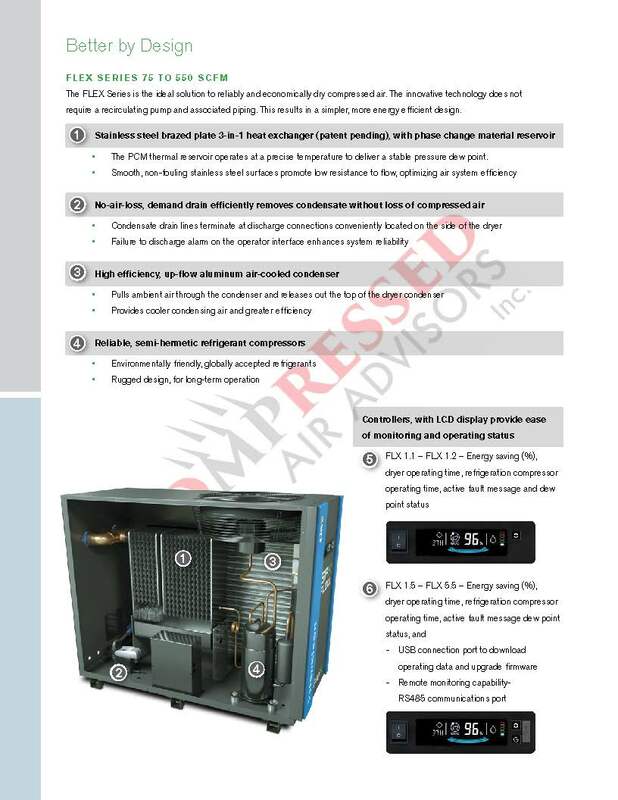 FLEX Series dryers automatically cycle (on /off) the refrigeration compressor in response to inlet load conditions. 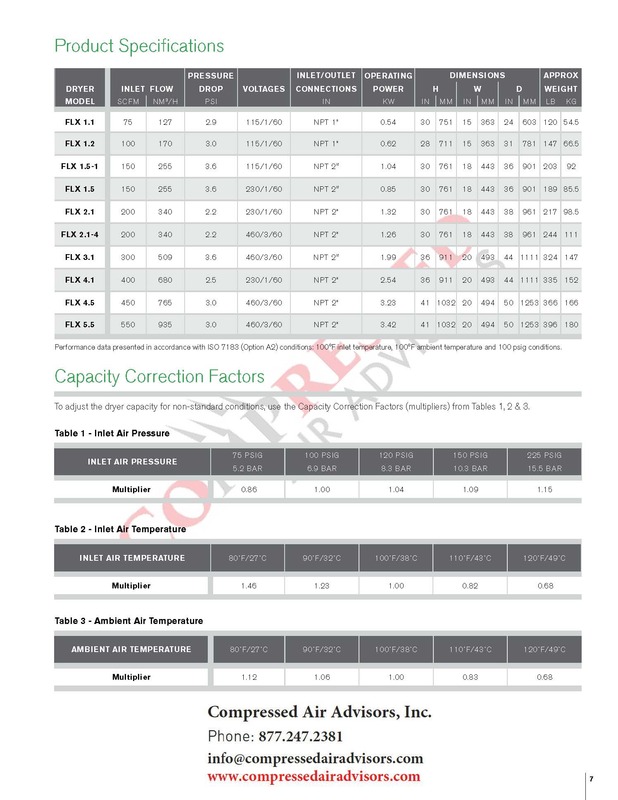 As the inlet air load is reduced, the power requirement to dry the air is matched in proportion to the demand. For example, at 60% inlet air load, a non-cycling dryer consumes 96% of the full load power consumption, a 4% energy savings. 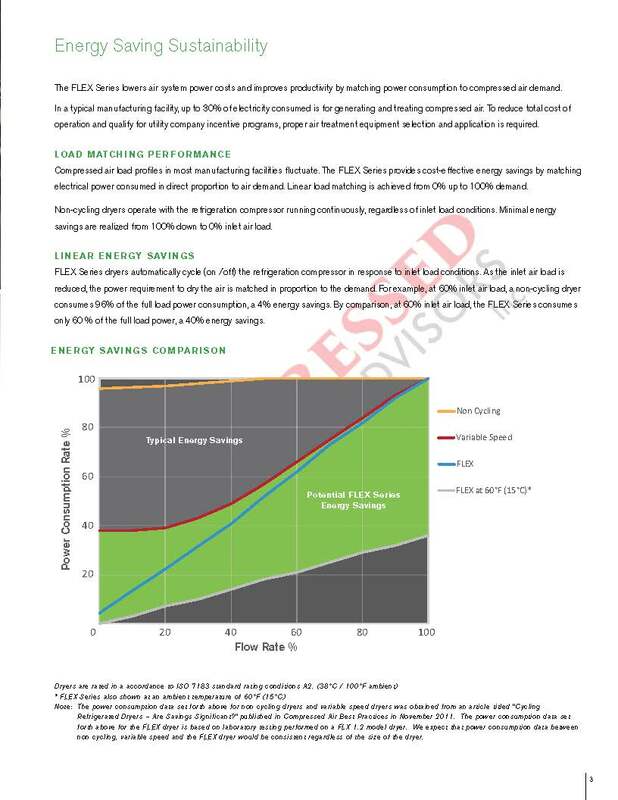 By comparison, at 60% inlet air load, the FLEX Series consumes only 60 % of the full load power, a 40% energy savings. 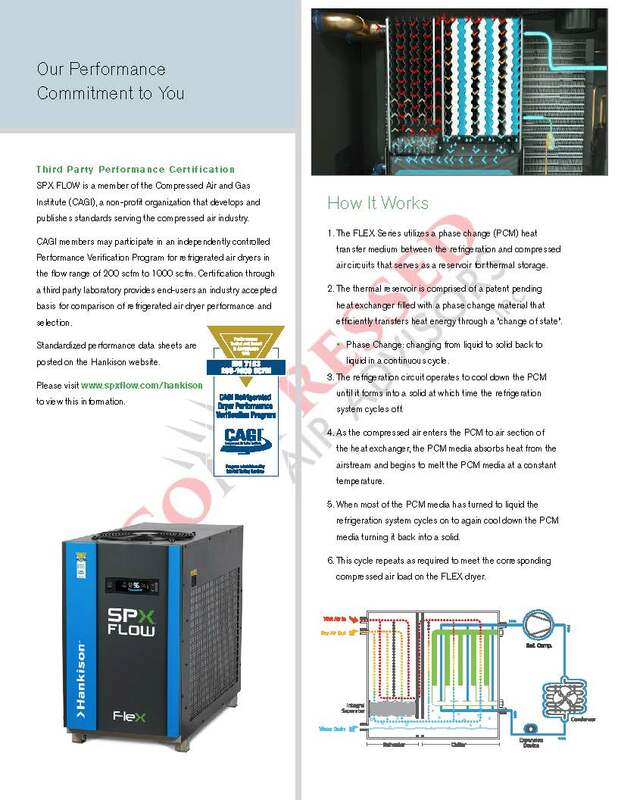 The PCM thermal reservoir operates at a precise temperature to deliver a stable pressure dew point.